The Subaru WRX is a fantastic hoon machine, but it must be kept in the right hands. One brand new owner says he took his car into the dealer for check-engine light and an easy repair only to have someone there "borrow" the car to take it to class and then wreck it. 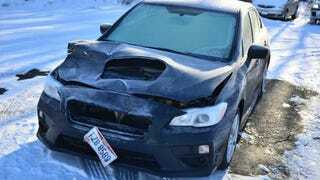 The owner posted his tale along with pictures of the damage on the North American Subaru Impreza Owner's Club Forum. I had my new WRX with 1300 miles throw a CEL. Code scanner says P0390 & P0391. I'm concerned. It's brand new, I broke it in according to the manual. I take good care of it. I take the car to Adventure Subaru in Mentor , OH. I speak with a service adviser, REDACTED. It's been there since Friday. I FB message him today to ask the status of my car. He tells me he needs to have a tech take my car home overnight for testing and that it is ok with Subaru and my warranty. I get a call an hour later from him stating that he hit a deer. As far as I know he is not a mechanic, just a service rep. Why is he driving my car? Then I go to the dealer and talk to the GM, Scott . He says that MY insurance will need to handle the claim as it was a deer strike. I go around back of the dealer to take pictures of my car and I notice that it is in an uncontrolled parking lot and unlocked. The front end is heavily damaged as shown in the video. Then I notice there are college books on the passenger side floorboard. It seems my car became the service advisor's commuter toy. I have admissions from the service adviser and the management that he was on his way to class when he crashed my car. I was at first promised to be put in a new car, but the owner is now stonewalling and saying they "might" be able to help me with a trade in. I feel like if I don't get my story out they are going to get away with screwing me. The owner even takes a video of the damage in addition to the evidence that he claims is the service advisor's college books in the car. In addition to all that, he also did some detective work and was able to screen capture what looks to be court records that reveal a less than responsible driving history on the part of the service advisor. This isn't the first time a dealership has had things go awry when attempting to fix a customer's car. Just recently we had a story about a damaged Corvette that was driven at over 100 mph. Once the story started to gain traction (the story blew up on Oppo and in the forums), the owner of the dealership apparently reached out and personally guaranteed a replacement vehicle. Good to know there are dealerships that will do the right thing.